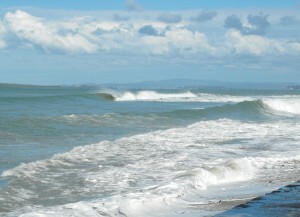 Rising sea levels are also more subtle by far than a cyclone. NIWA and Auckland Council coastal scientists want us to get our heads around what sea levels may be like, not next year, but throughout our lifetimes and beyond. These scientists have also highlighted how a storm surge event coinciding with a king tide (and in the future higher sea levels) would dramatically increase the impact on our coastline. What would the impact of Cyclone Pam have been if it had arrived on our coast four days later during the king tide on the 22nd March, where sea levels were around 60cm higher than average? Unlike places like Vanuatu, it was widely recognised that Auckland was given a reprieve from the effects of Cyclone Pam, with only some short-term impacts on infrastructure. This included power outages to 1491 Auckland homes in areas like Oneroa, Silverdale, Kumeu, Takatu, Riverhead and Remuera. 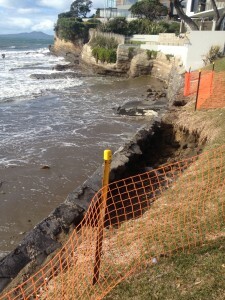 What about the impacts on coastal infrastructure that are subject to repeated, but smaller storm events? One example is the rock wall at Rothesay Bay beach. 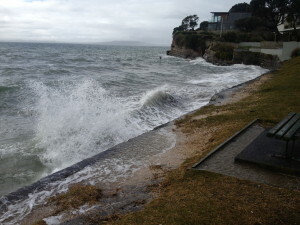 After September 2014’s king tide, a northeast wind of 15 knots and swell rising to 2 metres, combined with a 3.0m high tide on September 13th to produce inundation of Rothesay Bay’s foreshore, boat ramp and car park. Fast forward to the same spot on the 24th April 2015 following April’s king tide, and we see that the rock wall has been undercut with erosion to sections of the foreshore. 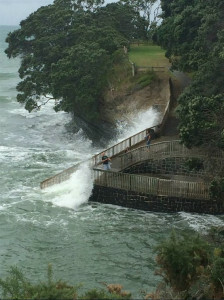 People using the coast for recreation can play a vital role in capturing photos at their local Auckland beaches during these storm events. 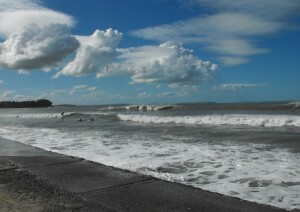 For example, the wealth of photos from surfers at spots on the east coast which require a cyclone of Pams’ magnitude to break, provide a photographic record of the impact of swell and tide on this coast which is particularly valuable to understanding current and future impacts.